The Induced Polarization (IP) phenomenon is observed as sub-surface materials become electrically polarized when energized with an electric current. Metallic minerals exchange ions with electrolytes at the surface contact, creating an opposing current. The extra voltage necessary to drive current through this barrier is called the “overvoltage.” When the current is switched off, these electrochemical voltages dissipate, but not instantly. The study of the decaying capacitance as a function of time is known as “time domain” IP, and relates to the concentration of metallic minerals and clays along the current path. 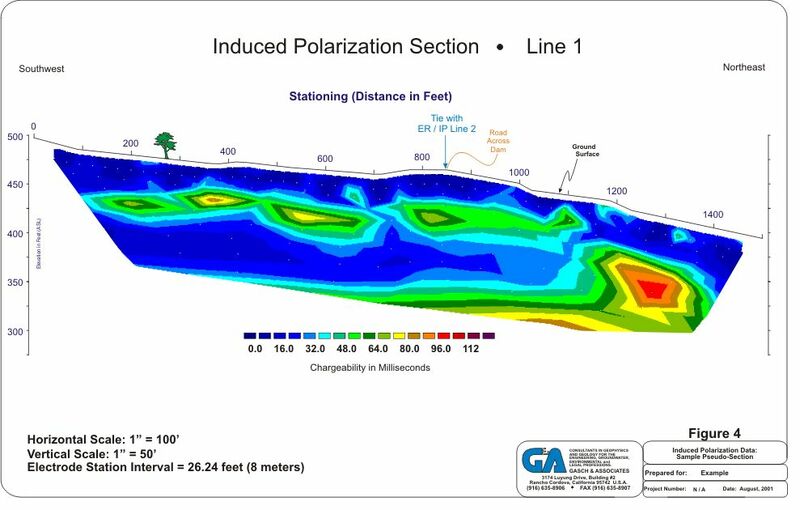 The simultaneous acquisition and later correlation of electrical resistivity (ER) and induced polarization (IP) data can be extremely valuable in groundwater exploration. Although the ER method indicates the location of water bearing strata, it does not determine whether this water is locked up in clays or moving freely through porous and permeable sands, gravels or fractures. The IP method indicates where clays exist, and when used in conjunction with ER, can indicate the location of higher transmissivity, water saturated material.